Don’t be this harsh with a new brush! Scumbling is a painting technique where a broken, thin layer of colour is applied over another, letting patches of what’s underneath show through. The result is visually stimulating and textural, producing a sense of depth and interesting colour variations. Scumbling can be done with any paint, using a dry brush (very little paint on a brush, not a soggy, well-loaded brush), or by dabbing at the surface with a rough sponge or crumpled cloth dipped in a little paint. 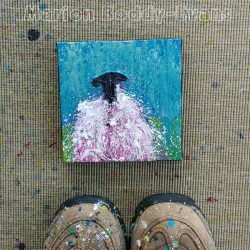 Also with dry mediums such as pastel, lightly dragging a soft pastel (the softer the better) held on its side across the top to add a broken covering of a new colour. It might help to think of the technique as tickling the surface, or using up the last little bits of paint in the brush, leaving behind fragments of colour. Or if you prefer to be vigorous, scrubbing at a painting with a not-quite-clean brush. Work on the top surface of the painting, the top of texture ridges, the tops of the canvas fibres, not filling in ditches. And on dried paint, not wet, so the scumbled paint sits on top rather than mixing in. Rather go over an area again than start with too much paint. Wipe a brush dry after rinsing, dip it into a bit of paint, then dab it on a cloth to remove most of the paint. It can feel wasteful, but practice teaches you to get less on a brush. 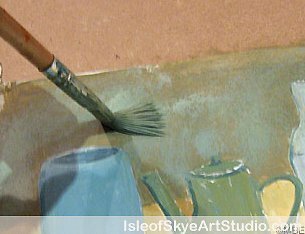 Remember you can also dip your brush into this wiped-off paint rather than fresh paint on your palette. It helps if the paint is stiff as it doesn’t spread as easily when you apply it. Holding a cloth around the brush hairs at the ferrule end will help pull moisture out of the brush without removing the pigment.